Hespèrion XXI and Jordi Savall have produced another real winner! Savall says in his rather flowery introductory essay that the appeal of this music is in its mystery. Well, in part that's true. But there's a lot, lot more. Here are necessarily speculative interpretations of some of the earliest (c.1270-1320) instrumental music whose manuscripts have come down to us. It's also music of striking beauty and lasting appeal. Savall suggests that the music's rhythm and "poetic charm" are what attract us. Since these are both vague and slim terms, it's as well that the playing of the highly respected Hespèrion XXI is as accurate and disciplined as it is – without managing for a minute to lose the atmosphere or expressiveness of the 15 dances for the court of Philip IV of France (1285-1314). Indeed, rhythm is emphasized throughout Hespèrion XXI's playing (though not overmuch). And the music's lyricism. But the structure and individual moments of pathos, humor, drive and charm are never bypassed. 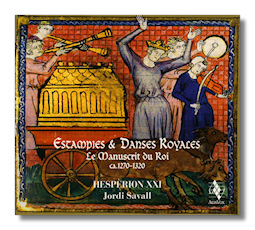 Some time during the years around the turn of the thirteenth century an enterprising and unknown musician copied the music to the well-known "Chansonnier du Roi"; it is this that Savall has restored and re-interpreted on period instruments for this excellent AliaVox CD, also available on SACD. Savall dates the manuscripts (français 844, Bibliothèque Nationale) to around 1310. Only in 1907 were they rediscovered (by the French musicologist, Pierre Aubry); since then, many have been played, anthologized and presented in one form or another. Indeed some of the melodies will sound familiar to listeners with even a glancing familiarity with "early" music. But none has yet infused them with such careful and meticulous performance detail while at the same time preserving their very essence. It is highly atmospheric music; the chromaticism; the spare allocation of instruments; the generally langourous pace – except where excitement is called for; the wayward harmonies, always promising something else… the plangent Chanson by Borneill (1175-1220), Non posc sofrir qu'a la dolor [tr.6], for example, has the simplicity and poignancy of the most desperate and heart-rending of folk songs. This is one of the achievements of Savall and his players: they have allowed their superb musicianship, experience and technical skills to inform the imagination, interpretation and energy with which this sinuous, emotionally-charged and extremely beautiful music must have been played seven hundred years ago. They have brought it fully to life now. There was little indication, of course, in the manuscripts, of tempi, instrumentation, ornamentation etc. Yet what these experts have done is make the movements as vivid and unselfconscious as seems possible. Never is attention drawn to phrasing, textures or pace other than to let these work with the music itself. Pieces such as No m'agrad iverns ni pascors and the Danse II [trs.9,10] are played with such immediacy and depth, the musicians following changes in tempo to enhance the ensemble, and bouncing the rubato off one another in the Danse, for example, that they could have been written yesterday. As Savall explains, there are sources to be consulted in "reconstructing" this music. They have ben used. But this recording is not an archaeological record. That would also have given cold, equal weight to everything. It's an occasion. As though the players were sitting or standing in front of their most important regal audience ever – yet relying on tempered enjoyment to perform well. In addition to Savall's essay, David Fallows has five excellent, informative and authoritative pages explaining the musicological background to the works. In particular, it is to be noted just how complex, subtle and intricately-structured work the estampie is. These are not rough country dances. They are sophisticated media to express something of a pinnacle of early European achievement and must be seen as "art" music with a nevertheless raw spontaneity and passion. Just the qualities that Savall and Hespèrion XXI bring out in them with never a glance in the direction of spectacle or effect. The recording is excellent with a warm yet energetic acoustic and stimulating balance of instruments. It's a CD that all enthusiasts of the early medieval repertoire should buy instantly, if for no other reason than to convince their doubting colleagues that the humanity, originality, musicianship and poetic accomplishment of this collection can hold itself against all-comers. Warmly recommended.